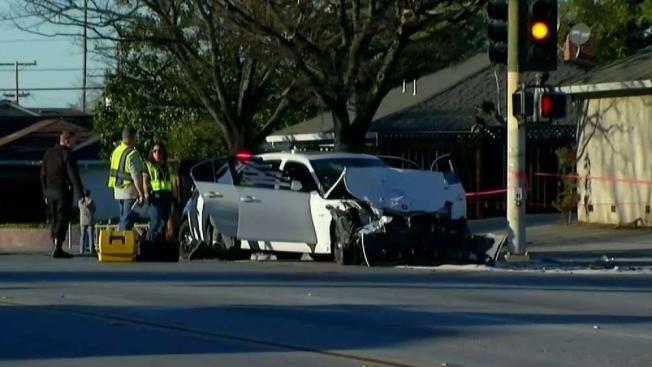 A man suspected of burglary was killed after the vehicle he was fleeing police in hit another car in San Jose Thursday afternoon, police reported. Police began investigating the burglary at 12:55 p.m. in the area of Corumba Court and Vargas Drive. Police said officers spotted the suspect as he was walking from the front door of a house to a white 2005 BMW 525i. Police said the suspect and BMW may have been in the same area during a burglary hours earlier. The suspect saw police and got in the BMW, which sped away followed by police. Officers were outpaced by the driver in the area of northbound Meridian Avenue and Coleman Road. The officer didn't continue the pursuit, but followed in the same direction, police said. A short time later the driver crashed into a black 2008 Lexus SUV at Meridian Avenue and Kooser Road. The driver ran from the scene and has not been located. He is in his late teens, wearing a dark hooded sweatshirt and dark pants. The Lexus driver is expected to survive, police said. Two passengers in the BMW were taken to a hospital and one of the passengers was pronounced dead. The other, a 17-year-old boy, is expected to survive and will be booked into Santa Clara County Juvenile Hall for burglary and attempted burglary. He was the person police saw walk away from the front door of the home. The vehicle had been reported lost or stolen, and police found stolen property from several recent burglaries inside. The driver is wanted for burglary, attempted burglary and felony hit-and-run. Police said the hit-and-run resulted in the fifth vehicle-related fatality of the year. The man's identify will be released by the Santa Clara County medical examiner's office. Anyone with information is asked to call 911 or Detective Kevin McMillin at (408) 277-4654.